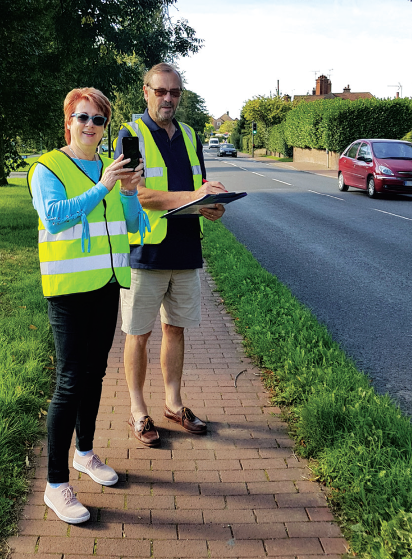 Members of the Cuckfield group ran a Speedwatch session at Whitemans Green during the summer using a specially calibrated device from Sussex Police that is effective from up to half a mile distance away. We chose Whitemans Green because dog walkers and children have difficulty crossing the road to use the playing fields/skateboard park. As with the last time we ran a session here, about 10% were speeding and pedestrians thanked us for making drivers more aware of the limit. Most drivers did slow down when they saw our hi-vis jackets, and we are happy about this because the aim is to educate drivers. We noted that drivers setting a good example successfully slowed up all the traffic behind them. So, keep it up Cuckfield residents! The number of vehicles were counted in one hour was 296 and 28 cars were noted to be driving above 35mph. Their details have been logged on the Community Speedwatch site and Sussex Police will send letters to the drivers as well as checking their tax and insurance. We ran another session in August by the Rose and Crown pub and noted seven cars driving too fast. Sussex Police have since advised us that two of the cars we reported on our previous session didn’t have any tax. We aim to pop up in various Police-approved sites around the village throughout the year. If you have one or two hours a month free and would like to join our group, please send an email to info@ cuckfield.org.